Birding Taiwan: Hualien - coast and hills. Hualien - coast and hills. I had a chance to revisit two good birding locations near Hualien - the city closest to unmissable Taroko Gorge. Previous observations regarding Taroko here and here. This time I spent an hour, late morning, on the northwest side (on the city side) of the river, see here for the other side. For a well rounded day’s birding, try to combine this location, with good views of sandbars, with observations from the other (southeast) side of the river mouth - and then follow #193 south for a few km. Possible to access by car, but probably easier to explore by bicycle along on the excellent bike path. 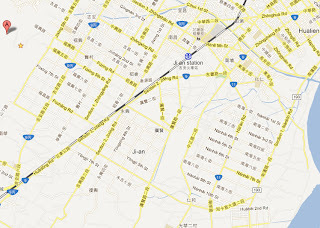 If driving or on motorcycle, from Nanbing Road (aka #193, city side of the big bridge) take Huazhong Road to the east end. List of what I remember: Various egrets (ignored details...); Mallard Duck (introduced); 20+ Eastern Spot-billed Duck; 20+ Kentish Plover; Common Moorhen; Skylark; White Wagtail; Plain Prinia; Yellow-bellied Prinia; Golden-headed Cisticola (heard only); Grey-tailed Tattler (distant, unsure); Black Bulbul. This (楓林步道) is probably the best forest birding site close to Hualien City, (see also Tsuochang). With only an hour available on a hot July lunchtime I was still able to get nice views of a few superb birds: Red Oriole (usually fairly reliabe here); Black-naped Monarch; White-bellied Erponis; Besra. Another very large raptor was kicking around. Fenglin start marked on left. Hualien downtown top-right. Other sought after birds often reported here: Black-necklaced Scimitar Babbler; Taiwan Scimitar Babbler; Grey-throated Minivets; Taiwan Barbet; Grey-capped Woodpecker; Bronzed Drongo; Bamboo Partridge. In winter Grey-cheeked Fulvetta and Sibia can be present. Good for butterflies too. Great views over the city. 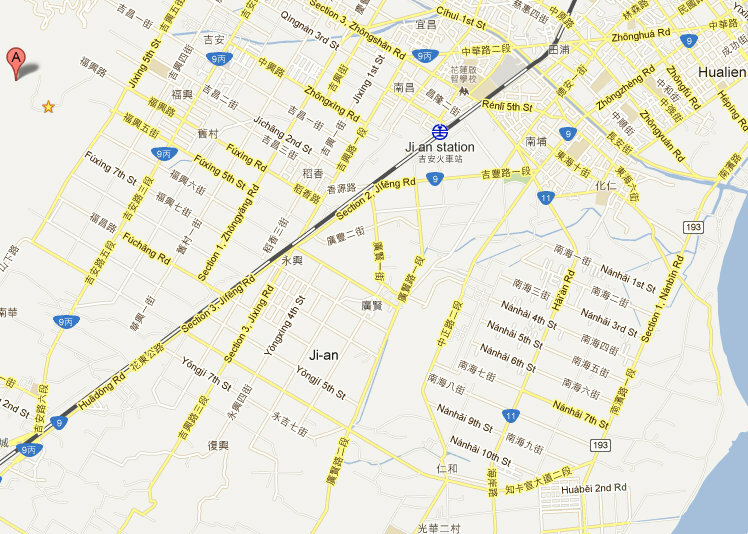 Technically part of the suburb of Hualian City - Ji-an. To get there is fairly easy - find and follow Fuxing Road to the end. Sporadic bilingual signs for Fenglin/Maple/Maplegrove. Google map here. A good variety of native vegetation alongside the weaving 3.5km driveable road. As usual I stayed in our Taroko Lodge. In the grounds, or very close by, there were: Bamboo Partridge (heard only); Common Pheasant; Black Drongo; Japanese White-eyes; Hwamei (heard only); Gray Treepie; Long-tailed Shrike; Chestnut Munia; White-rumped Munia; Myna; Tree Sparrow; Taiwan (Styan’s) Bulbul; Spotted-necked Dove; Taiwan Barbet (heard only). I found Black-spectacled Toad and Olive Frog in the nice pond on the grounds. Previously I think I’ve identified correctly Ornate Narrow-mouthed Toad, Latouche’s Frog and Chinese Tree Toad. Dragonflies: Brachydiplax chalybea, Anax panybeus, Ceriagrion latericium, Butterflies er...another time! Late summer Tainan coast and wetlands.